I love this, I love that Morgan has this. You're all very, very lucky. Yes, we really are. I'm scared of him losing this safe place next year when he transfers to a different school for middle school (4th grade is middle in our parish). Hopefully, we will continue to have positive experiences. For now, we are cherishing what he has. Maybe some of these kids will transfer with him, and they can show the new kids how awesome Morgan is. My fingers are crossed for this. Thank you for writing and sharing this. It's beautiful. 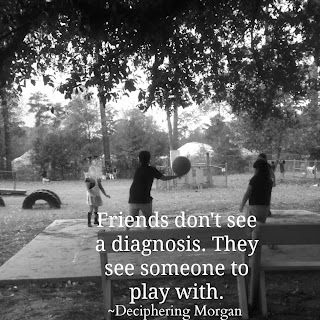 This made me cry..but in a good way.My eight year old is diagnosed as having an intellectual impairment and also has a severe speech delay.I went to his first quarter parent teacher conference and was justed awed by the way his nt peers look aftee him and include him according to his teacher.